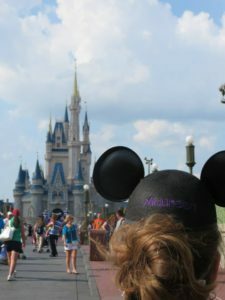 My name is Maureen, and Disney has been a part of my life since day one. My parents and my godparents made sure that I grew up a Disney Girl. From riding Dumbo when I was 10 months old (They tell me I absolutely loved it! ), to seeing Beauty and The Beast as one of my first movies at the movie theater, to dressing up as Minnie Mouse when I was 7 years old. Then riding the Carousel of Progress when I was 12 to recently celebrating my 30th birthday and riding Dumbo again, there is just something about the place of Pixie Dust that has always made me smile! I work in the radio industry and I am a life long student. Learning never stops. I love researching things that I am passionate about, and having the opportunity to write about Disney is something I am super excited to peruse! Favorite Part of Disney: World Showcase looking out at Spaceship earth. Favorite Disney World Moment: My 30th Birthday and my parents’ 35th wedding anniversary coincided in 2015. How do you celebrate such milestones? You go to Disney World of course! The trip was made even more special when my godparents joined us for 5 days of fun! One of the first dates my parents went on was to see Lady and the Tramp in theaters. My mother was unaware that Tony’s Town Square Restaurant existed. It was the ultimate surprise when we booked a dining reservation and surprised her. Seeing her shock and awe when we walked in and she saw the Lady and the Tramp statue, was such a special feeling, it still brings tears to my eyes. As an added bonus, as we were eating, we had the perfect view of The Festival of Fantasy Parade. It couldn’t have worked out better if we tried.